In this post, I'll share my experiences, instructions rather, in deploying your website/web apps in different free web hosts. However, this post will not provide detailed information and thorough explanations. Whether for deploying your personal project, your school project or for testing out your web apps, there are several web hosts in which you can deploy them for free. If you know how to use Git, a version control system, then nice 👍. If not I recommend learning it, these resources might help you out. 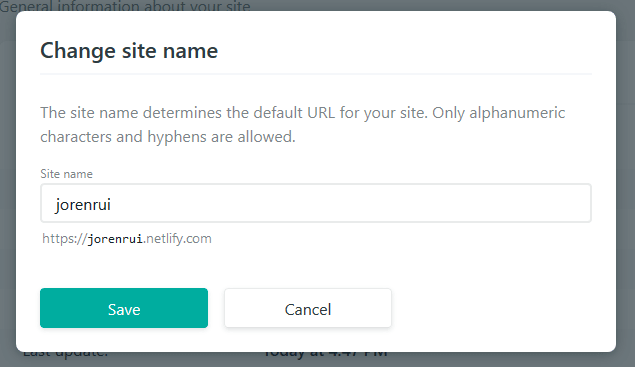 For websites, you can use Netlify in which you can upload your files. 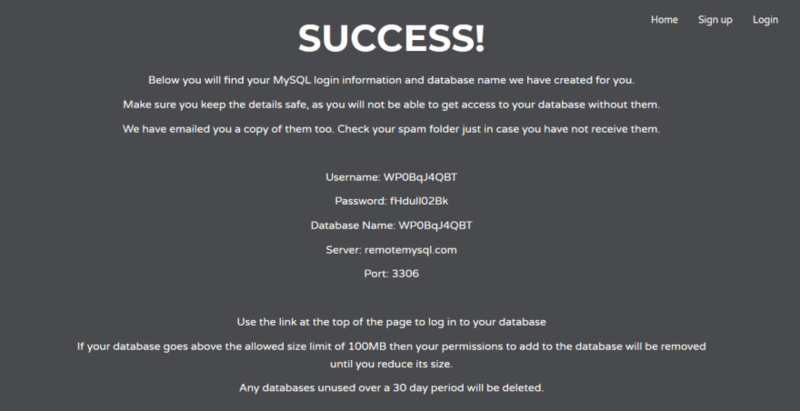 If you have a PHP+MySQL web app, you might want to try out 000webhost. You can host up to two web apps on it per account. I'm assuming that you have a ready-to-deploy website or web app. 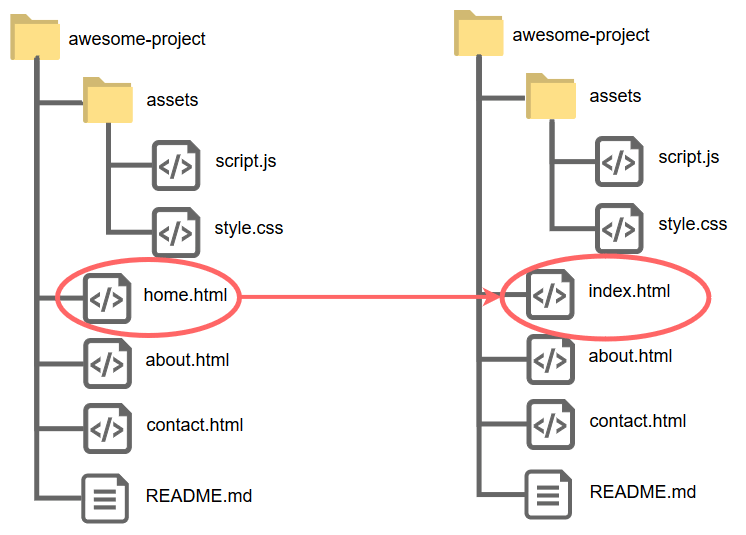 For your project that doesn't need any database, you can use static web hosts. But if you want to deploy your PHP+MySQL web app, then you check out dynamic web hosts. Also, I may refer to your app or the project's folder as a repository. 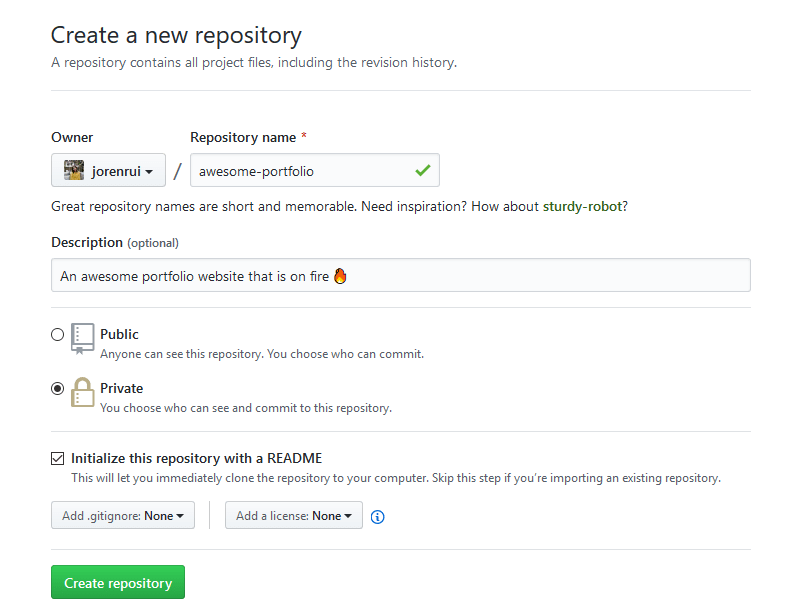 A repository is like a folder for your project. Your project's repository contains all of your project's files and stores each file's revision history. You can also discuss and manage your project's work within the repository. make sure that you have an index.html. Think of it as the home page of the website. Rename your primary HTML file to index.html if you don't have one yet. If you are using a PHP framework like Laravel and CodeIgniter then you're good to go. Be careful in using 000webhost cause it has been pwned. Another web host you might want to check out is Glitch. @ThePracticalDev @jorenrui Glitch.me for dynamic host pages work quite and easily imports/exports with GitHub repos. A suggestion by Bervianto Leo Pratama was updating the Database Credentials in the Config Vars in Heroku. For other web hosts, you can also update the .env file and manually upload it, so it would not be included in the source control. GitHub is one of the best places to host your code. It offers unlimited private and public repositories. It is well known as a place for open source software. Host and review code, manage projects and build your best software alongside 31 million developers. GitHub Pages is one of the services that GitHub offers. 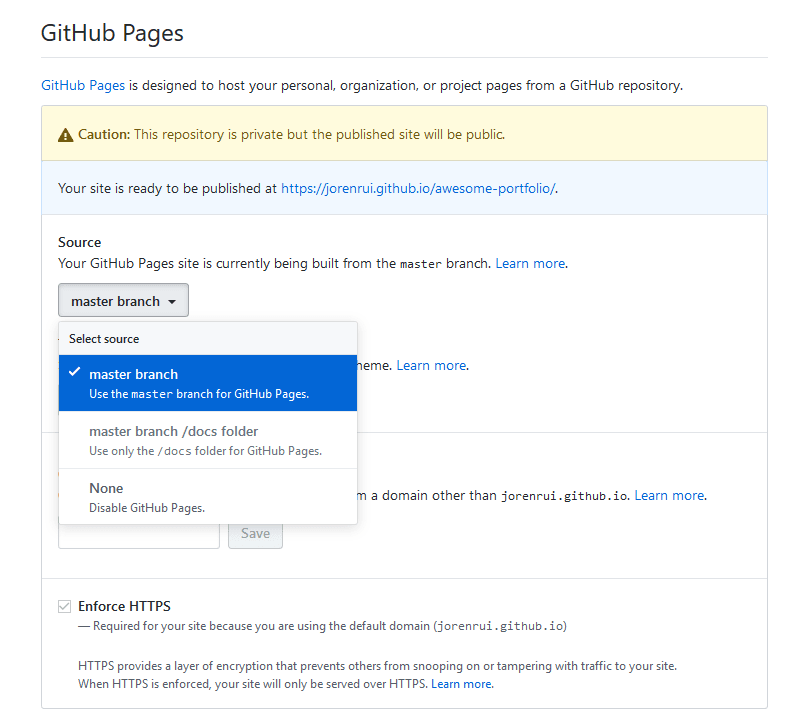 GitHub Pages is a static site hosting service designed to host your personal, organization, or project pages directly from a GitHub repository. 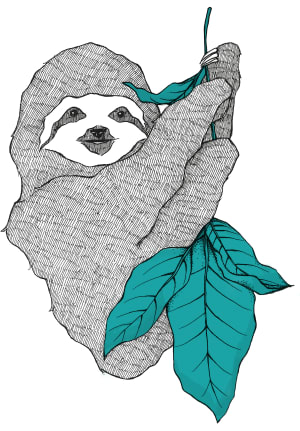 If you don't have a GitHub account yet, you may create one here. In the navigation on the upper right corner, click the New Repository under the plus icon. You only need to fill out the details, then click Create repository. After that, you can now add some files to your repository. Note: by default you are in the master branch of your repository. and scroll down to GitHub Pages. Then, click on the master branch. If you want to use https://<your-username>.github.io rather than https://<your-username>.github.io/<repository-name>, you just need to name your repository <your-username>.github.io. This is suitable for portfolio websites. For more information you can visit GitHub Pages. GitLab is one of the places where you can host your code and deploy it. It offers unlimited private and public repositories. 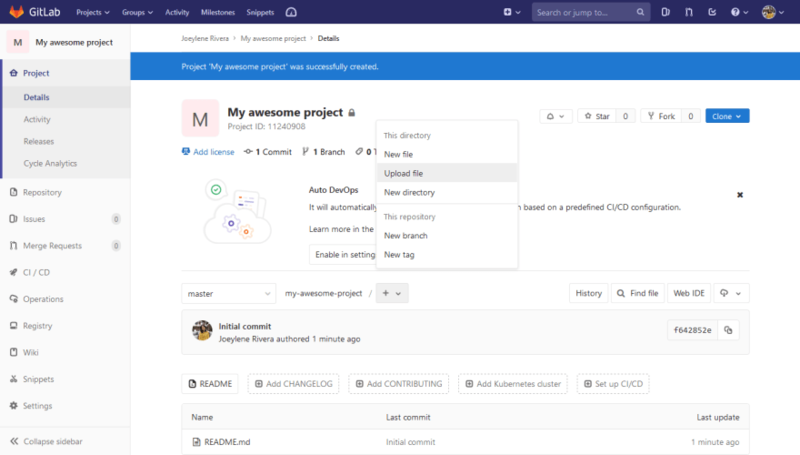 GitLab provides a single application for the entire software development and operations lifecycle. GitLab provides everything you need to Manage, Plan, Create, Verify, Package, Release, Configure, Monitor, and Secure your applications. GitLab Pages is one of the services that GitLab offers. 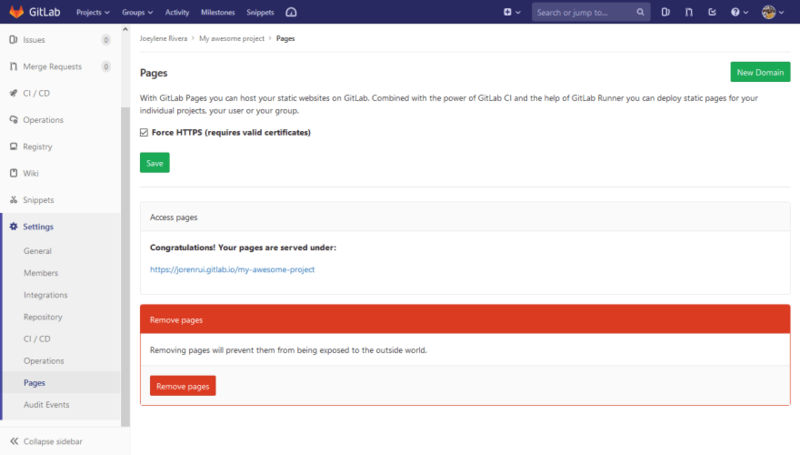 Host your static websites on GitLab.com for free, or on your own GitLab instance. If you don't have a GitLab account yet, you may create one here. In the navigation on the upper right corner, click the New Project under the plus icon. Or you can press the green New Project button on the right. Then, fill out the details. After that, you may click Create Project. 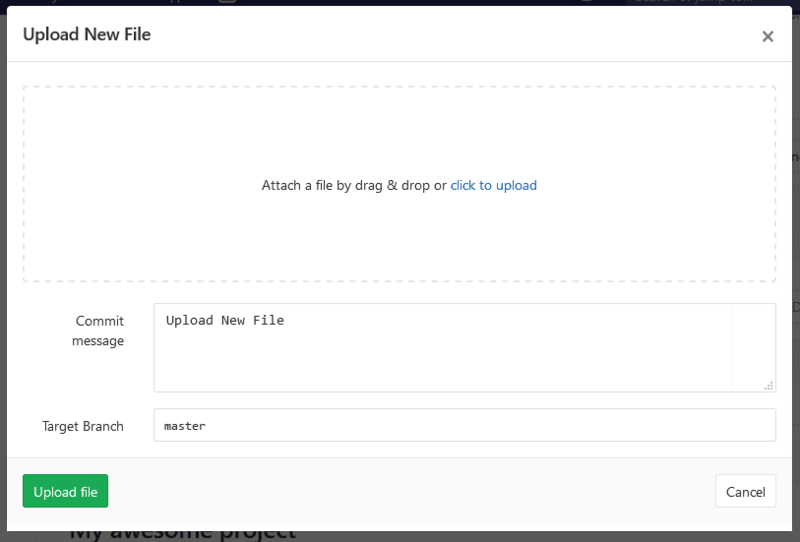 Then you can drag or upload your file. As for the commit message, type something that describes what you did. For example, if you added an About Page then you can type Add About Page. To get started, click the Set up CI/CD. This will then create a configuration file for your deployment. You can pick a template. For simple projects, just pick HTML. 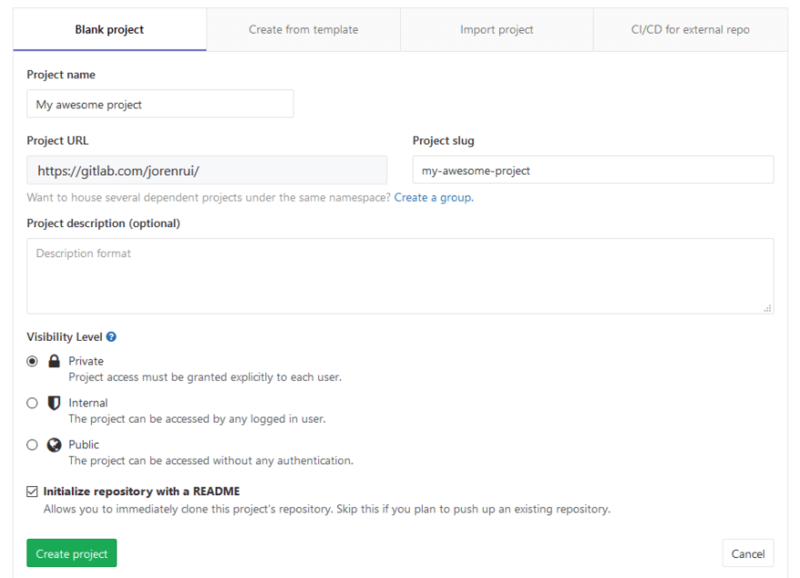 The GitLab CI/CD will then build and deploy your website using GitLab Pages. In the sidebar, go to Settings then Pages. You'll find your website's URL there which is https://<your-username>.gitlab.io/<repository-name>. You may see a 404 Error for now. But don't worry, it just needs some time before your website is up and running. Try to check if again after a few minutes. If you want to use https://<your-username>.gitlab.io rather than https://<your-username>.gitlab.io/<repository-name>, you just need to name your repository <your-username>.gitlab.io. This is suitable for portfolio websites. For more information, you can visit GitLab Pages. Netlify offers an easy way to deploy your sites. 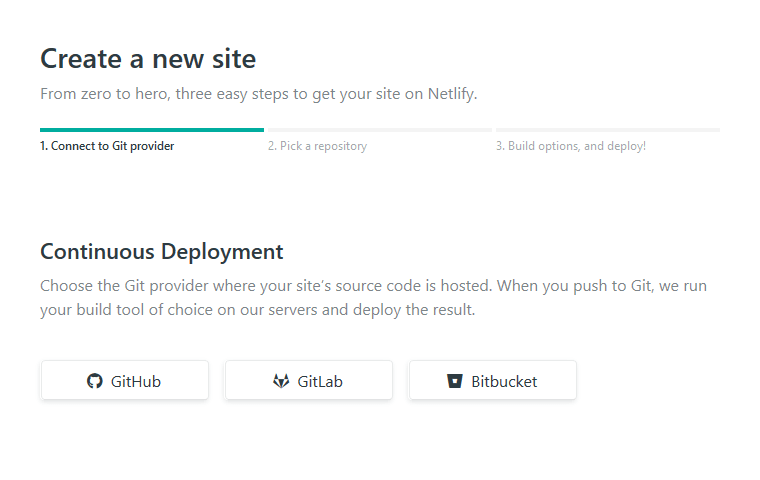 If you don't have a Netlify account yet, you may use your GitHub/GitLab/BitBucket Account or create one here. You can deploy your site by uploading your files or connecting it to your repository. Then, Netlify will now deploy your site. In this case, you can see the website at https://naughty-babbage-f0df56.netlify.com. You may change the site's name here. If you want to update your files. Go to Deploys. Drag and drop your project folder, then Netlify will take care of the rest. Wait till the badge near the Production changes from Uploading to Published. When it's published then you're site is now updated. 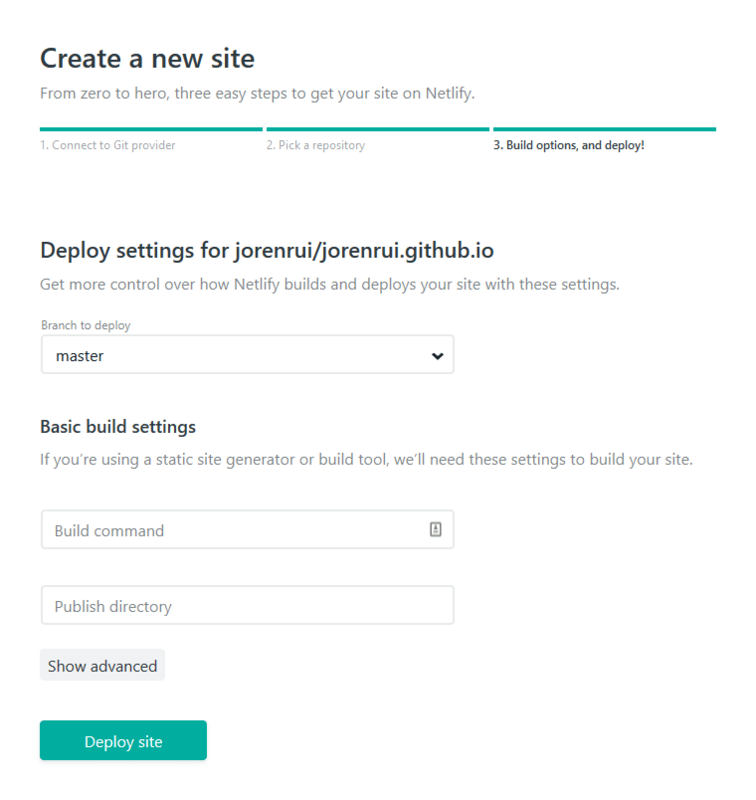 Another way of deploying your site is by connecting your repository to Netlify. You may do so by clicking New site from Git. 1. 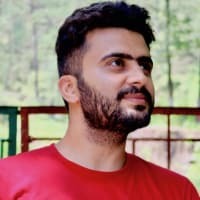 Connecting to a Git provider which can either be GitHub, GitLab or BitBucket. You can leave build command and publish directory blank if you're not using Hugo, Jekyll, Gulp and the like. With that, the site is live at https://keen-lamarr-271c97.netlify.com. In this case, I'll be changing it to jorenrui. After that you're all done. Congrats 🎉Your site is now up and running. For more information, you can visit Netlify's Docs. Surge is another static web host in which you can use to deploy your site. It uses the command line in deploying your application. First go to your project folder. In this example, the folder's name is jorenwebsite. You can now login or create an account from the command line. Save your domain name by using CNAME. In your project folder, create a file named CNAME. Or create a file named CNAME, open your text editor, add your domain name, and then save it. In this case, the domain name is jorenwebsite.surge.sh. Just replace it with yours. Hurray ✨ You're all done! For more information, you can visit Surge. In this part, we're going to use Heroku + Remote MySQL combo to deploy our Laravel web app. 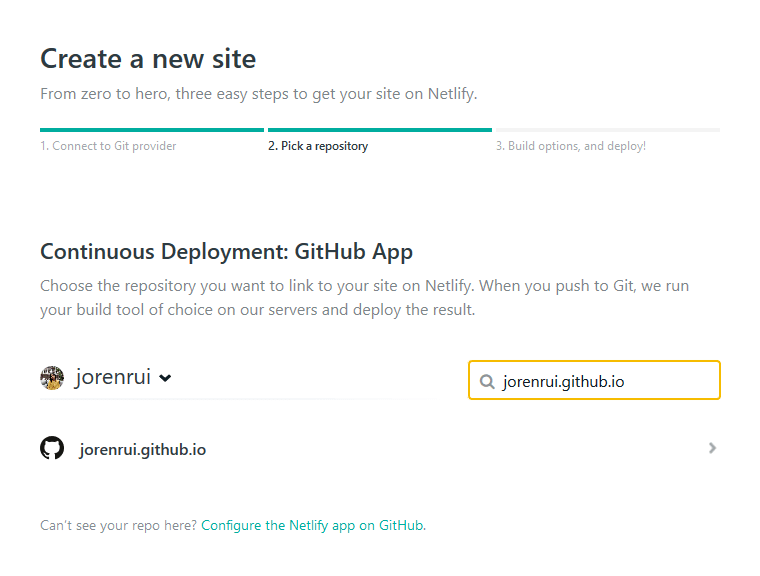 Heroku is one of the great places to deploy your web apps. It makes use of Git to deploy your apps and has its own Heroku CLI in which you can run bash. Assuming you have a functioning git repository, go to its directory. In this example, the project's folder is named jorenweb. This will set the document root to public/. git commit -m "Add Procfile for Heroku"
Replace jorenweb with your chosen app name. The app's name will be the domain name which is https://<app name>.herokuapp.com/. Leaving the app's name blank will make Heroku generate a random one for you. where the ... is the key you copied from the php artisan command. The App's URL is <app-name>.herokuapp.com. In this example, the app's name is jorenweb. Or go to https://<app name>.herokuapp.com/. Note: There may be some error if your app needs a database on startup. There are several websites that offer free MySQL that comes with PhpMyAdmin such as Free SQL Database and db4free. Note that you should only use this for testing purposes and not for production. In this post, we're going to use Remote MySQL. You can have up to 3 databases using the same email. Create a Remote MySQL Account here. After that, take note of the username, password, database name and port. Using these different approaches, we'll update the host, database, username, password of the mysql connection. Using the Heroku CLI, first make sure that you are logged in. On Heroku, login and go to your app. In the navigation, go to Settings. Then scroll down to Config Vars and click the Reveal Config Vars button. You may see the APP and APP_KEY in which you set earlier in the process of creating the Heroku app. 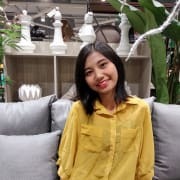 In config/database.php, update host, database, username, password in the mysql connection. git commit -m "Update MySQL DB Configuration"
To access the database using PhpMyAdmin, login to Remote MySQL. Then, enter the username and password you've received during sign up. After that, just import your SQL dump. The other way is using Heroku Bash. Congrats! ✨ 😆 You're all done! asset() uses HTTP while secured_asset() uses HTTPS. But if you don't want to force HTTPS on environments, there is another solution. This will change the URL from HTTP to HTTPS when in production. Then you may commit this changes, then push to Heroku. In composer.json, move fzaninotto/faker from require-dev to require. git commit -m "Update composer.json"
For more information, you can visit Heroku's Documentation regarding Laravel. 000webhost is a free web host that support PHP and MySQL apps. It also comes with a control panel which has PhpMyAdmin and a web-based file manager. If you don't have a 000webhost account yet, you can create one here. Then you'll receive an email to verify your account. After verification, create your first website either by clicking Create your first website or Build Website. After that it will ask you questions like your Website Name and Password. Your web address will be <website-name>.000webhostapp.com . In the case above, the web address is jorenweb.000webhostapp.com . In the navigation, go to Website Manager then click File Manager. This will take you to the File Manager page. Scroll down and click on Upload your files button. Then you'll be directed to the 000webhost File Manager in which you can now upload your files. Make sure that you're in the public_html directory. For uploading your files, you can either drag and drop your files or click the upload icon. I suggest archiving your project's folder as a zip file, upload it, and then extract it. In extracting it, let the directory be . in which you'll be referring to the current directory that you're in. In this case, extracting it to the public_html directory. After that, you're done uploading your files. You may now delete the zip file. Go to the extracted folder. In this case, it is jorenwebsite. Select the files you're going to move and click the move icon. Then change the destination to /public_html. Lastly, delete the folder in which the files where extracted. In this case it is jorenweb folder. With this your site is now live at <website-name>.000webhostapp.com . In the navigation, go to Website Manager, then click Database Manager. 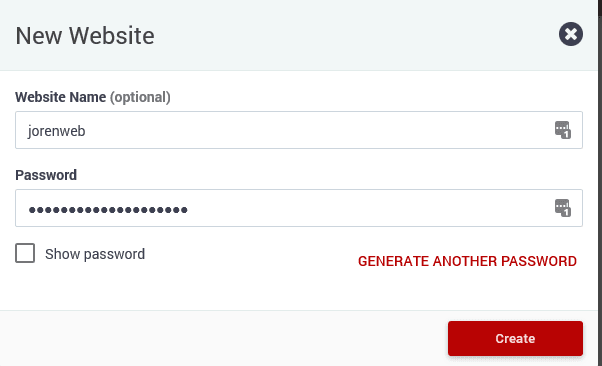 Then enter your Database Name, Database Username, and Password. You can now update your database configuration. 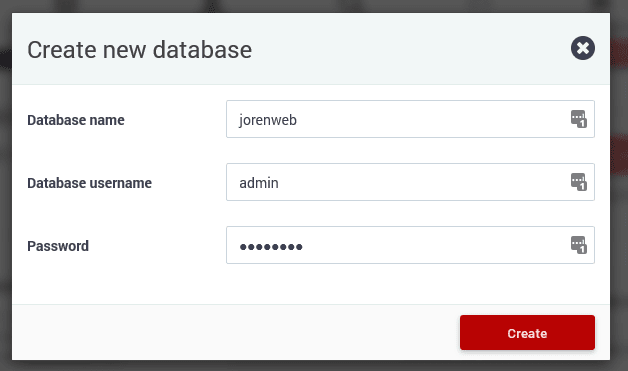 Then you can manage your database using PhpMyAdmin. In the navigation, go to Import. In here, upload your SQL dump. Check the domain’s availability and click Checkout. Or go to My Domains > Management Tools > Nameservers to set it up. Also, pick the period in which you'll use the domain name then you may continue. In checkout, you'll receive an email in which it will redirect you to a registration page to finish the order. In the navigation, go to Website Manager then click Set Web Address. Scroll down and click Add Domain. Pick Park Domain then enter the domain name you registered in Freenom. Then wait for the domain name to be linked. Changes may take up to 24 hours. If you want some SSL certification for your website, you can use Cloudflare for free. For more information, you can visit the 000webhost forum. For websites that doesn't need a database you can use static web hosts like GitHub Pages, GitLab Pages, Netlify, and Surge. You can also explore and find other web hosts like Zeit and AWS Amplify. As for PHP+MySQL web apps, you can check out 000webhost if you're a beginner that doesn't use any frameworks. But if you want to deploy a Laravel App that uses MySQL you can check out Heroku + Remote MySQL. On the other hand, Heroku doesn't only offers PHP web app hosting. It can also host NodeJS, Ruby, Java, Python and Go web apps. These are the web hosts that I've found as I searched for ways of deploying my web apps. 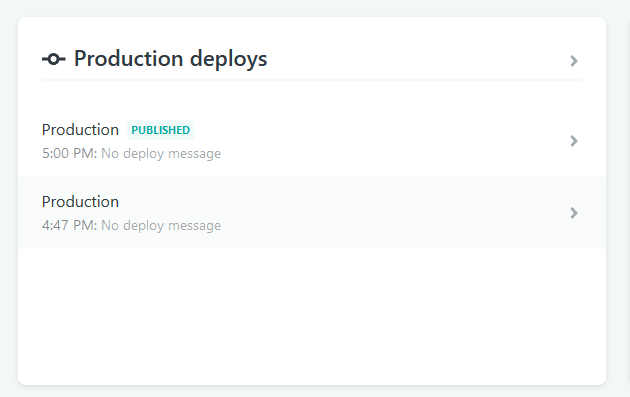 From uploading files to using Git thru the CLI, my deployment process became easier. I mostly enjoyed my shift from 000webhost to Heroku as I became comfortable with the CLI. I hoped that sharing this managed to help you in some way. 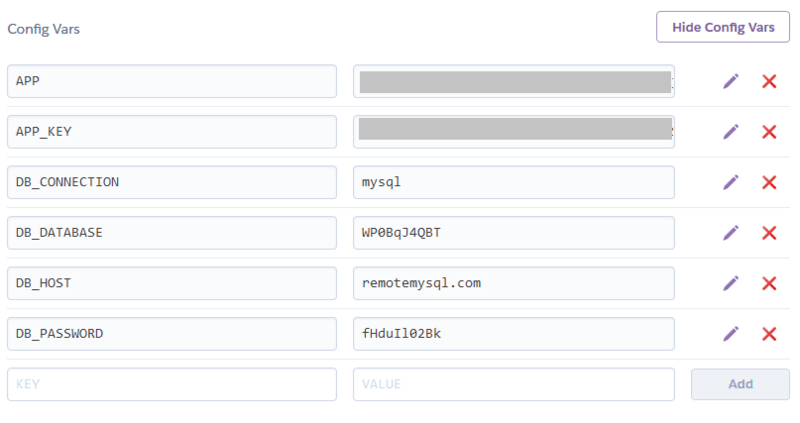 Hi, I suggest to change database credential in .env file or in heroku you can use ENV that heroku already provided it. To make sure for secret things never in commit. To make sure another people also not doing commit credential in they code (especially for open source code). Ow I see 🤔 If you put it that way, then I'll add those steps regarding Heroku Config Vars. Thanks again for your suggestion! FWIW: firebase hosting is also a candidate for free static web sites. Yes 😃 All dynamic web hosts like Heroku and 000webhost can also be used for static sites. I just didn't include it cause I haven't added how-to-do-it for those. Great resource. Adding to my reading list. Very insightful and helpful article! Thanks for sharing it with the community. Very helpful and detailed article. Many thanks!